Polar Bears live within the Arctic circle. They can be found in Canada , Alaska, Norway and Northern Russia. They are the world’s largest land Carnivoran. (The world’s biggest Carnivoran is a kind of seal, the Southern Elephant Seal, and is much more comfortable in the sea than on land) They are also the largest bear – being just a bit larger than the Brown Bear. An adult male Polar Bear weighs about 350 – 680 kg (770 – 1500 lb) and the adult female weighs about 150 – 250 kilograms (330 – 550 lb). When she is pregnant, she weighs as much as 500 kilograms (1100 lb)! 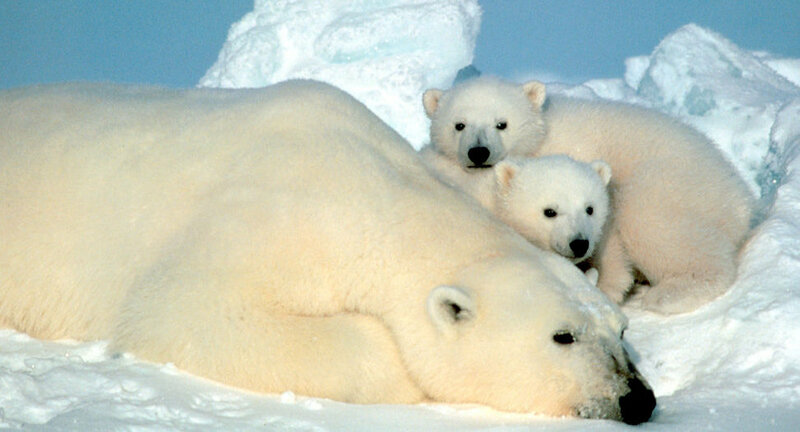 The temperatures where Polar Bears live ranges from an average of -34C (-30F) in winter and 0C (32 F) in summer. The polar bears are able to withstand the extreme cold because they are covered with a dense white fur coat. The height for an average male polar bear is about 2.4 – 3 metres (8-10 feet) and female polar bear is about 1.8 – 2.4 meters (6-8 feet). They are born on the land but they spend most of their time at sea on the sea ice. That is why some people say the polar bear is a marine mammal. They can stay on the sea ice for months and hunt. The sea ice is like a big flat piece of ice drifting on the sea. This sea ice covers the waters in the Arctic oceans. Seals will migrate according to how the sea ice changes. When the seals migrate, the polar bears will also migrate, because seals are the polar bear’s favourite food. In some areas, if the ice melts completely in summer, the polar bears migrate to the land and wait for months until the sea ice is formed. In the Beaufort sea, polar bears will move each summer further north where the ice remains frozen all year round. The closest type of bears to polar bears are the brown bears. The polar bears have a longer build and a longer skull and nose. They have a small ears and a small tail but they have huge paws. Their paws are much bigger compared with other bears’ paws. These large and rounded paws allows the bears to be able to spread out their weight while walking on snow and sea ice. The paws are like built-in snowshoes for the polar bears. Their paws measure about 30cm (1 foot) across in an adult polar bear. What’s more, the pads of the paws are covered with small bumps which provide good friction when walking on slippery ice. The polar bear’s claws are short and solidly built compared to those of the brown bear. Having these kinds of claws help the polar bear to grip onto heavy prey or ice without any problem. Polar bears have 42 teeth. Their molars are smaller and sharper than the brown bear’s molars. Being meat-eaters, their canines are large and sharp. Polar bears are insulated not just by their fur but by a layer of fat up to 10cm (4 inches) thick. Their skin and fur will overheat if the temperature goes above 10C (50 F). Their fur consists of a layer of dense inner fur and an outer layer of hair, which looks off-white. The outer layer fur is about 5 to 15 cm thick (2 to 6 inches) and covers almost the whole body. The off white fur will usually become yellow as they grow older. when they are kept in a warm and humid place, their fur may turn a pale shade of green because there will be algae growing inside the outer fur. Males have longer hair on their front legs which will increase in length until the bear is 14 years old. The polar bear has a very good sense of smell. It is able to detect a seal which is nearly 1.5 km (1 mile) away and buried a metre (a yard) under the snow. Their hearing is as good as our hearing and they can see far too without any problem. They are wonderful swimmers. They will swim from sea ice to sea ice. They have been seen swimming 320km (200 miles) away from the nearest land. Their body fat helps them float. They dog-paddle with their head and much of their back above the water. Their large paws help them to propel themselves fast through the water. They can swim at about 10 km/h (6 mph). They tend to walk slowly and awkwardly. Their walking speed is about 5.5km/h (3.5 mph). When running at top speed, they can reach up to 40km/h (25 mph). Polar Bear is the most carnivorous of all bears. They feed mainly on seals. The Arctic is home to millions of seals. The seals are hunted by the bears when they surface in holes in the sea ice to breathe or when they climb onto the sea ice to rest. The polar bear’s most common hunting method is called still-hunting. The bear uses its excellent sense of smell to locate a seal breathing hole and crouches nearby, quietly and patiently waiting for a seal to appear. When the seal comes out of the hole to breathe the polar bear smells its breath and quickly reaches into the hole and drags the poor seal out with its paw. The long muzzle and neck of the polar bear enables it to search in deep holes for seals. Its powerful back legs give it the strength to drag even large seals onto the ice. The polar bear also attack seals when they are resting on the sea ice. For example, if the polar bear spots a seal, it will walk to within less than 100m (300 feet) and then it crouches. If the seal does not notice, the bear creeps to within 10 to 12 metres (30 – 35 feet) of the seal and suddenly rushes towards it and attacks. A third hunting method is to raid the birth home of the female seals. Adult bears tend to eat only very rich foods – the skin and thick layer of fat of a seal. Young bears which do not need to depend on their mother anymore but do not have enough hunting skills or the size to hunt seals, have to look for dead animals left behind by other bears. The young bears may also forced to accept a half-eaten dead animal if they kill a seal but cannot stop a bigger bears from stealing it. Poor thing! The polar bear is a huge powerful predator. It can kill an adult walrus, but they rarely try to. A walrus can be more than twice the bear’s weight, and has long ivory tusks which are about 3 feet long (90cm). The walrus uses these tusks as a deadly weapon to defend itself. Polar bears also hunt Beluga Whales, by catching them from their breathing holes in the sea ice. The whales are the same size as the walrus and in fact it is very difficult for the polar bear to kill them. Polar bears very rarely attack a full-grown adult whale. 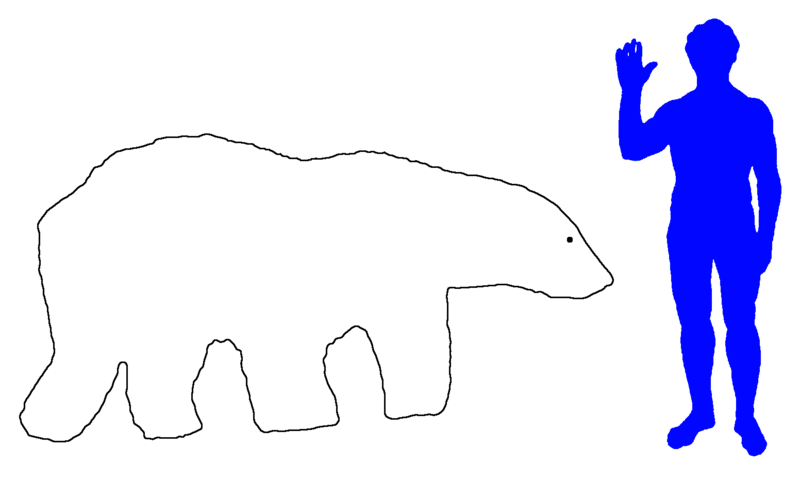 Most land animals in the Arctic can run faster than the polar bears on the land because the polar bears gets overheated quickly. Most marine animals the bear meets can swim faster than the polar bears too. So, you see, Polar Bears are not the fastest runners on land and not the fastest swimmer in the sea. In some places, the polar bears eat young walruses and the dead bodies of adult walruses or whales. Polar bears are active throughout the year except for the female pregnant bears. A pregnant female Polar Bear is too heavy to be active. She has gained at least 200kg (440 lb) on top of her original weight. She will enter into an icy den to give birth. The cubs are born blind, covered with light brown fur and weigh less than a kilogram (less than 2 lb). They are completely helpless – they would quickly freeze to death outside the den! They only open their eyes after about 30 days. They are born between November and February, when it’s dark and cold in the Arctic. The mother still doesn’t eat while feeding the cubs with milk. The mother will normally give birth to two cubs each time. She will stay with her cubs in the den until the cubs are big enough to take care of themselves. When the cubs are ready, she breaks open the entrance of the den. Her cubs will be about 10 to 15kg by then (22 to 33 lb). For about 12 to 15 days, the family will spend time just outside the den and she will still stay close to her cubs. The cubs will play with each other. Gradually the cubs will start to take long walks from the den to the sea ice. The cubs usually remain with their mother for about a year and a half, while learning how to hunt. All in all, the mother bear has to do without food for about 8 months. Polar Bears have the ability to slow down its metabolic rate when food is hard to find, and they will increase their metabolic rate again when food is abundant. The polar bears are able to slow down their heart rate from 46 to 27 beats per minutes. They are able to fast for up to several months when the sea ice melts and they cannot find seals to hunt. They will live on their fat reserves for months during that time. Polar bears can also eat muskox, reindeer, birds’ eggs, rodents, shellfish, crabs and even other polar bears. They also eat plants like berries, roots and kelp but only very rarely – they need a very fatty diet, and seals and whales are the fattiest foods they can get. They would not be able to get enough energy from just land animals and plants. They rarely attack humans unless they are disturbed. But a hungry polar bear might kill and eat a human. So, don’t ever disturb a hungry bear! They are sneaky and cunning hunters. Their prey is often caught unaware. If a person is attacked by a Brown Bears, they will be seriously injured, but then the bear often just leaves the victim alone. When a polar bear attacks a person, the person rarely survives. So, if you are attacked by a Polar Bear attacks you, say your last prayers! Adult polar bears usually live alone, but they have often been seen playing with other polar bears for hours and even hugging each other while sleeping. The cubs are playful. they are able to bellow, roar, growl, chuff and purr. They are less affected by infectious diseases and parasites than most land mammals. They rarely live more than 25 years. The oldest wild polar bear on record died at the age of 32 years old and the oldest captive female polar bear died in 1991 when she was 43 years old. When wild polar bears are old, they become too weak to move around to hunt for food. They will gradually die of starvation. Apart from that, wild polar bears who are badly injured in fights or accidents may also die because they are unable to hunt any more. They will also ended up dying of starvation. The polar bears are top level predators. They have no predators of their own, although their cubs will sometimes be eaten by hungry wolves or brown bears. Polar bears have long been hunted for their fur, meat, fat, sinews, gallbladder and their canine teeth. They are hunted by the people native to the Arctic. Traditionally, these hunters would use something to distract the bear, and then they would spear the bear or shoot it with arrows. The fur was used to sew trousers and footwear. The meat is edible. The fat was used in food and as fuel for lighting up their homes. Sinews were used as threads for sewing clothes. The gallbladder and sometimes the bears’ heart were dried and powdered to make medicine. Their large canine teeth were used to make amulets. Not many humans lived in the extreme cold of the Arctic, therefore the hunting of polar bears did not effect the population of the polar bears. On 15 May 2008, the U.S. government has classified the polar bears as a threatened species under the Endangered Species Act. The effects of global warming has significantly affected the lifestyle of the polar bears. Due to warmer temperatures, the sea ice now melts much earlier than it did 30 years ago. This means that Polar Bears will have a shorter feeding season and they will eventually die of malnutrition. Apart from that, pollution and oil spills in the Arctic ocean also threatens the life polar bears. The U.S. Geological Survey predicts two-thirds of the world’s polar bears will disappear from the face of the earth by 2050 due to global warming. 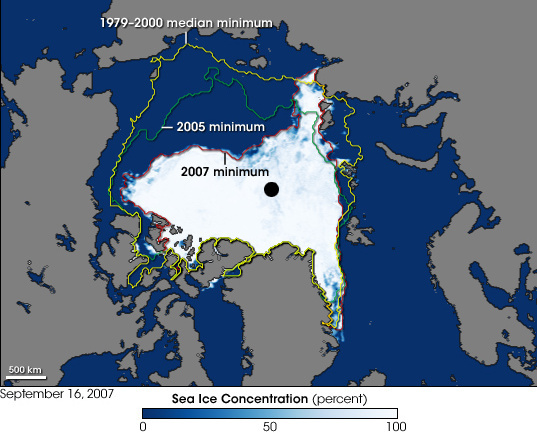 The amount of sea ice in the Arctic is getting smaller and smaller each decade, as you can see in the map below. If this sea ice disappears, the poor Polar Bear will be in big trouble, and might not survive at all except in zoos.